My friend Tracy is looking for this wallpaper, but in a smaller size. You can find it HERE at Anthro. I also recall a British? Australian? company/website that sold this an other crazy wallpaper (maybe this company is the source of Anthro's paper)... anyway.... got any tips for Tracy? She wants the print, only smaller - as wallpaper. You can find the wallpaper in Toronto at Hollace Cluney. 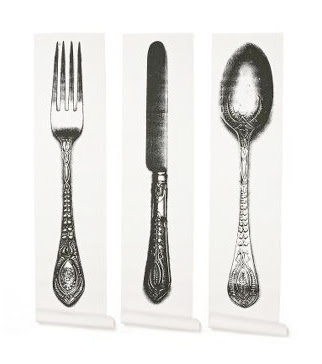 This wallpaper and many other designs like it are part of The Collection (http://www.thecollection.fr/v1/), a Paris company that features European designers. What about using rubber stamps on the wall to simulate smaller scale wallpaper? I've seen silverware stamps like these at Michael's and you could have your own made in whatever size you want from some clipart.